In this video we will discuss different ways of passing data between components. There are several techniques to pass data between components in angular. We discussed most of these techniques in our previous videos in this series. If the components are nested, then there is a parent child relationship between those components. To pass data from the parent to child component we use input properties. To pass data from the child component to parent component we can either use output properties or template reference variables. Let's use some of these techniques to pass data between components. Along the way we will refactor the code in the angular application that we have been working with so far in this video series. This will give us little more practice with component communication techniques. We are refactoring code in our application in preparation for performing DELETE and UPDATE operations in our upcoming videos. By the end of this video, our Employee List page should be as shown below. #childComponen template reference variable is not required on <app-display-employee> child componenet. So delete it. Remove the <div> element that surrounds <app-display-employee> child component. We want to pass the Search Term we type in the "Search By Name" textbox to the child component DisplayEmployeeComponent. So notice on <app-display-employee> we are binding to searchTerm input property. We do not have this searchTerm input property DisplayEmployeeComponent yet. We will implement that in just a bit. In list-employees.component.ts file we are not using the Router service anymore. So remove it from the import statement and the constructor. At this point the code in list-employees.component.ts should be as shown below. 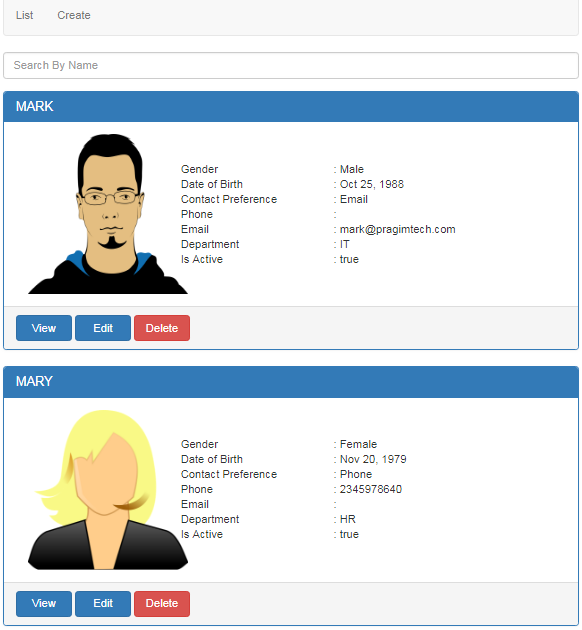 Changes in display-employee.component.html file : Include a panel footer. The HTML required for the panel footer is shown below. Paste this HTML just before the last closing </div> element in display-employee.component.html file. Changes in display-employee.component.css file : Include the following style for the View, Edit and Delete buttons so all of them have the same width. Changes in display-employee.component.ts file : Include searchTerm input properrty. This is the property to which the parent component (ListEmployeesComponent) is binding ans passing the searchTerm we have typed in the "Search By Name" textbox. Also, include viewEmployee() method. This is the method that is called when "View" button is clicked. Changes in employee-details.component.html file : Modify "Back to List" button as shown below. Notice we have removed [queryParams] directive. We included this [queryParams] directive to demonstrate merging query parameters. Also set queryParamsHandling to preserve instead of merge. Changes in app.component.html file : In the menu we do not need "Get Employee with Id 2" link. So remove the associated menu item. In our upcoming videos we will discuss implementing UPDATE and DELETE operations. Please explain . searchTerm not working When click View Next Employee Button . My URl http://localhost:4200/employee/3?searchTerm=jo, But when i click View Next Employee Button my URL changed to http://localhost:4200/employee/1?searchTerm=jo . And view Mark's Details.